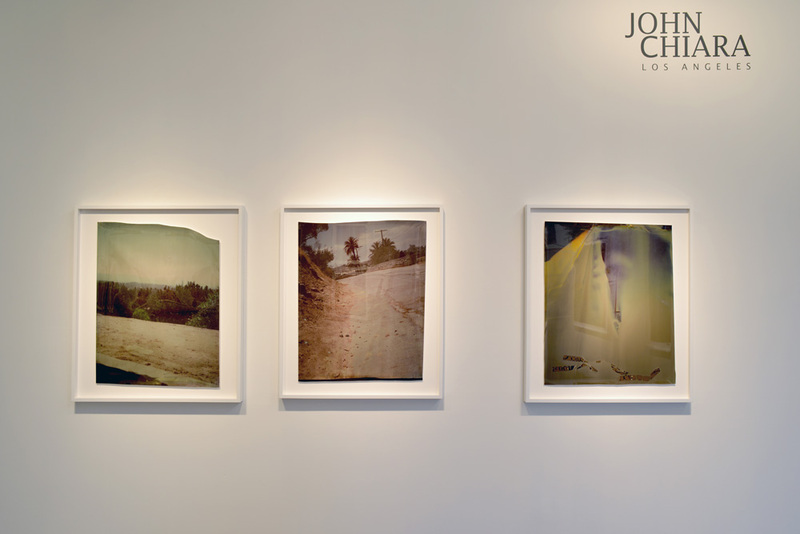 San Francisco-based artist John Chiara pushes the boundaries of the photographic medium through his choice of process and the mastery of its possibilities. His approach is distinguished by its incredible physicality and recalls the early days of the medium when artists dealt with heavy, awkward equipment and endured long exposure and development times. Chiara’s giant cameras, which he designed and built himself, are transported to locations on a flatbed trailer to produce one-of-a-kind large-scale prints. The design of the cameras, which is much like daguerreotype box cameras, allows the artist to simultaneously shoot and perform his darkroom work while images are recorded directly onto oversized photosensitive paper (not film). This process, which Chiara first discovered as a student in 1999, invites anomalies in his final prints and adds to the mystery and lyricism of his pictures. Though L.A. is a one of the most habitually photographed cities on the globe–a city built on image–Chiara’s depictions of it defy precedent and expectation. His Los Angeles is neither idyllic rural Eden nor sprawling urban hell. It is not the mythic city of glamour nor the spectacle of exploitation that it is often deemed to be. Instead, Chiara has honed in on delicate transformations in the environment, both natural and man-made. His interest lies with the psychological underpinnings of the city’s development and the subtle ways these are revealed in the shifting landscape. His Los Angeles images are powerfully direct: a desert fan palm growing implausibly through fortified concrete; the reflection of power lines in the blazing sun; a hillside exploding with scorched earth; the shimmering façade of the Department of Water and Power. But the subversive and idiosyncratic nature of Chiara’s uncommon technique makes for images that transcend conventional depictions of place and transforms familiar landscapes into hypnotic visual passages through the ordinary world.